What a refreshingly amazing dystopian novel! I am so, so happy that I got the chance to read this book. Lately, I've been in a slump when it comes to dystopia novels. I've read so many, and they all start to sound very similar. This book was so different! And there is a key part of this book that I absolutely LOVED. Watch as I ramble about that part, a few paragraphs down. This book is written in the points-of-view of three characters: Bea, Quinn, and Alina. In the beginning of the book, we are introduced to Alina, who steals a plant with a friend. We are introduced to Bea and Quinn, who live within the dystopian society and are more privileged than Alina. Well, at least, Quinn is more privileged than both Alina and Bea. Bea and Quinn are best friends. Bea is totally in love with Quinn. Both of them don't meet Alina until a few chapters in - and when that happens, Quinn is intrigued and interested in Alina. Immediately, I didn't like Alina. Although Alina had no romantic interest in Quinn, I still didn't like that she received his attention over Bea. I think the author definitely did an EXCELLENT job with that - clearly showing how each character felt about the others. I thought it would be difficult to understand things, with the fragmented chapters in different points-of-view. I mean, one chapter with get Alina, the next Quinn, back to Alina, then Bea... I thought the book would be choppy. BUT, Crossan does an amazing job with keeping the story going despite characters being in different places (sometimes), and despite the differing thoughts and emotions running high. Anyway. So, the thing about the plants. In the beginning of the book, Alina steals a plant. In this story, there are very, very little sources of natural oxygen left in the world. There are no trees. Think the Lorax - no trees, no oxygen. The society is protected in a bubble, and if people go outside the bubble, they need crazy expensive oxygen tanks and masks. Well. Bea and Quinn are going to take a trip out of the bubble. Alina is trying to escape the bubble with the plant, but doesn't have clearance. So, guess how everyone meets? With prince Quinn pretending Alina is his girlfriend, and the two of them going through the easy, privileged Premium line, and Bea left to go through the other, slower, less privileged line. I love this part of the book - the no trees thing. I love the inclusion of an environmental sustainability theme. As an environmental engineering major, I really like seeing authors include real-world hazards in terms of the environment, especially plausible occurrences, like deforestation. The story of this book is so fascinating! 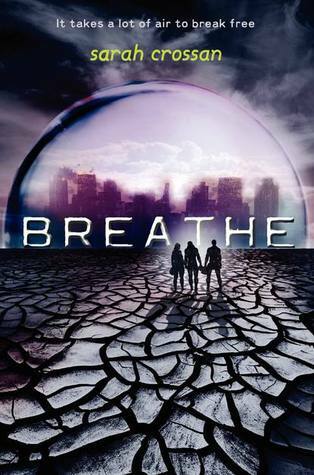 Alina, Bea, and Quinn all get out of the bubble, and Alina finds her way to the revolutionaries. But of course, Bea and Quinn are dragged into her mess. I love how nice and wonderful Bea was throughout the book, but then when she wanted or needed to be, she was tough and strong. Her character development was superb - I could clearly see her growth as a character. The same can be said for Quinn - he developed from a single-minded follower to a free-thinking leader. I was kind of on and off in terms of how I felt about him throughout the book, but by the end, he had made enough decisions that I thought deserved of my approval. Alina... I don't know how to feel about her. She definitely is my least favorite character of the three, but it's not like I don't like her, I just like her the least. I spent the majority of the book disliking her because of Quinn's feelings for her, and how she handled some situations. I still don't know if I like her or not, but I like her role in this book. In terms of romance, I'm actually not going to comment on that aspect, because it's complicated. There is a love triangle, BUT, it's the type of love triangle that I don't mind, because... well, you'll have to read the book to find out! I absolutely abhor love triangles, but this book's love triangle wasn't all that bad. The plot of this book is pretty great! I have a few complaints (see below), but I enjoyed it for the most part. I was definitely left wanting more by the end of the book. Good thing I have Resist! I already established that I didn't really like Alina, throughout the book. I'm interested in seeing how Crossan will use her in book two. I think Crossan wanted readers to dislike Alina a little, but I think I dislike her more than most people. Her decision-making skills are a little poor, in my opinion (Alina's, I mean). I also thought the plot of this book was a bit slow at times. I totally understand that with the three points-of-view, it's hard to keep the story going, because there is three times the amount of content to condense into a normal-sized book. But the book dragged on at times, like in the middle, and at the very end. I felt like the climax was a bit cliche, and lacking. But that could be the me that has read way too many dystopia novels talking. YES! Especially since there is a very important environmental theme running through this book. Love it! 4.5 stars -> rounded down to 4 stars. I'm so glad I have Resist! I cannot wait to dive in! YAY! Alina was so ehhh to me. But I'm glad that in Resist, you enjoyed reading her POV more than in Breathe! Thank you, Becca! I loved this book and need to get my hands on Resist! Like you, Alina wasn't my favorite character of the bunch, she just wasn't someone I could get connected with. Glad you loved this one and can't wait to hear what you think of Resist! Cool! I hope you do like NOW! I think a lot of people that I have talked to, that read Breathe months ago, also didn't like Alina. So it's not just me! Thank you, Sassy! Hope you love Resist! Awesome review Alyssa I've been dying to get my hands on this book I heard great reviews about it thanks for sharing Alyssa! I hope you do sometime, Katiria! The reviews have been pretty positive, for this one. You're welcome!